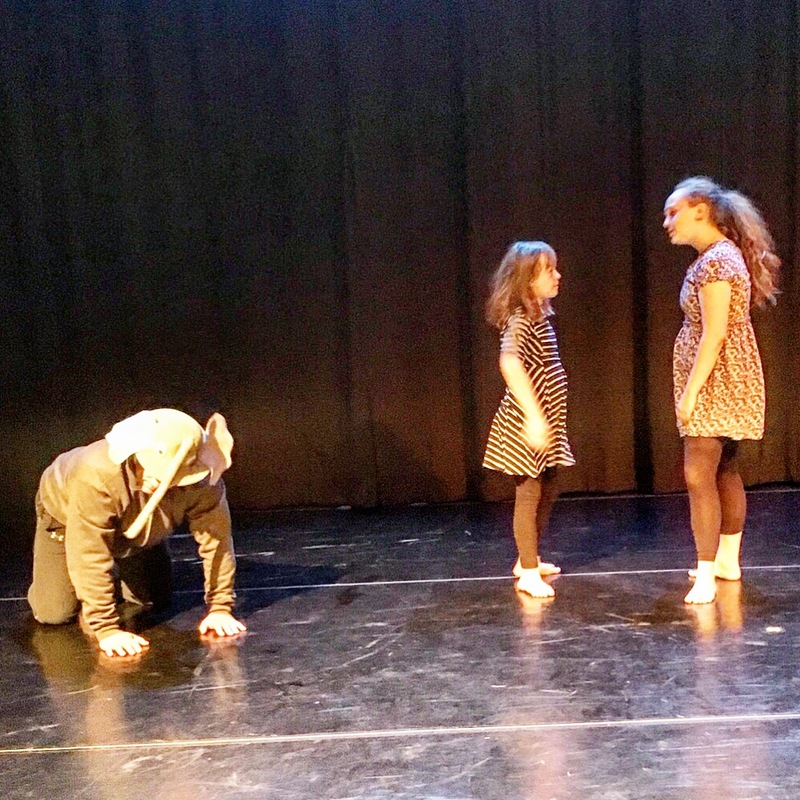 Each year in honor of National Poetry Month, Center Dance Ensemble — a modern dance company in Phoenix — celebrates with American Voices, short original pieces inspired by poetry, held in the small black box at the Herberger Theater downtown. The girls and I usually go. Center Dance is run by Frances Smith Cohen, my mom’s long-time business partner, and Frances’ dancers are members of our extended family, familiar faces from Snow Queen (Center Dance’s Nutcracker alternative that includes kids) and sometimes my kids’ dance teachers. In the past couple years, Annabelle has performed at American Voices, in a big group with my mother’s older dance students. But I was surprised this year when Miss Sally invited my two girls to perform alone. I do not know why we’ve always called her Miss Sally — she’s married and as she’d tell you herself, no spring chicken (let’s just say she and I are contemporaries). But ballet is funny, and Miss Sally was Annabelle’s first ballet teacher when she was 3. She’s had Sophie in class over the years as well. Sally is retiring from the company this year (I’m hopeful this is a Cher farewell tour situation, but I fear she really means it) and told me that for her final piece, she didn’t want to dance herself, she wanted to choreograph on my girls. Sally is a tough customer so I didn’t let her see the tears in my eyes. I did give her a funny look. “Sophie can do it,” she replied, meeting my gaze. Sally is a nice person but not gratuitous. She had a vision and it included Sophie, even though I can’t recall ever seeing a kid onstage during American Voices, and definitely not a kid with Down syndrome. Sally has always had great taste in music; I was pleased that she chose a Rickie Lee Jones song (lyrics count as poetry), and asked another Center Dance member, Brad Speck, to take part in the piece. And indulge me for a moment while I tell you how gorgeous Annabelle was, doing jazz choreography just a little out of her upright ballet comfort zone. That softened the blow of watching her in the maternal role, a role I think every parent of a child with special needs and a child without worries will be thrust up their kid someday. Onstage, Annabelle handled it with amazing grace, bemused by Sophie’s antics. Sophie rocked the dramatic aspects of the role and knocked out some pretty great dance moves herself. Thank you, Miss Sally, for a lot of years of love and lessons. Don’t make yourself a stranger, okay? In honor of National Poetry Month — and Rickie Lee Jones, and Miss Sally, Brad, my girls and Center Dance — I want to share the lyrics to Dat Dere. And what’s that doing there? Hey mama, up here! Mama, hey look at that over there! Mummy, can I go over there? Hey mummy, what is square? There’s no more anything here! Forever to manage to know who and why and where! Sometimes the questions get filed! Look at the cowboy coming there! Hey why they do that there? And how you put that there? Hey mummy, what is fair? 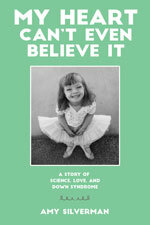 “My Heart Can’t Even Believe It: A Story of Science, Love, and Down Syndrome,” published by Woodbine House, is now available. You can order it from Changing Hands Bookstore or pre-order on Amazon. For more information about tour dates visit myheartcantevenbelieveit.com and here’s a book trailer.